Kwajalein (167.730E 8.717N) is the largest atoll in the world, 66 miles (106 km) in length, with a lagoon area of 655 square miles (1696 km2) and 93 islets with a total area just over 6 square miles (16.3 km2). It has an essentially unlimited ship capacity and 25 passes of up to 20 fathoms depth. The large number of passes was its chief liability, since this made the anchorage difficult to protect from submarines. Kwajalein was the principal Japanese base in the Marshall Islands, which were seized by the Japanese in 1914, during World War I. Japan received a League of Nations Class C mandate over the islands in 1920, but refused to turn the islands back over to the League after withdrawing from the League in 1933. This led to considerable mystery over the extent to which Japan had fortified the islands in the 1930’s, since foreigners were excluded from most of the Mandates. The islets of the atoll had ample room for military airfields. Two were built: one on Kwajalein islet itself and another on Roi-Namur (167.476E 9.395N), two islets that were originally joined by a causeway and subsequently silted together into a single islet. The Roi airfield, which covered almost the entire 1250 by 1170 yards (1140 by 1070 meters) of the islet, eventually boasted one 1330-meter (1455-yard) and two 1100-meter (1200-yard) runways and facilities for 72 torpedo bombers and 100 fighters. Namur, which was just 800 by 890 yards (730 by 810 meters), hosted the support facilities and had a 450' (137 meter) pier across the reef to the lagoon. The reef on the ocean side of both islets is 125 to 450 yards (115 to 410 meters) wide and drops abruptly, which in combination with the prevailing trade winds made for heavy surf. The reef on the lagoon side sloped more gradually and had much lighter surf, and the Americans chose to make their landings here. Kwajalein airfield had a 1200-meter (1310-yard) runway. The island itself is crescent-shaped, some 2.5 miles (4 km) long and 800 yards (730 meters) wide. The island was covered with palms and salt brush, particularly on its north side. There was a sea wall doubling as an antitank wall along its shore and a road circling the entire island. There were two small (100 yard or 90 meter) piers on the center of the north shore of the southern half of the island, and the much larger (500 yard or 460 meter) Nob Pier on the west shore of the northern part of the island. The reef is 100 to 130 yards (90 to 120 meters) wide on the ocean side and is completely exposed at low tide, with heavy surf at high tide. The reef on the lagoon side is 500 to 800 yards (460 to 730 meters) wide and studded with coral heads, but has light surf, and as with Roi-Namur the Americans chose to make their landings on the lagoon side of the island. Ebadon (166.825E 9.327N) was also large enough for an airfield, though none was constructed during the war. There was a seaplane base at Ebeye (167.738E 8.781N). Kwajalein was the headquarters of 6 Fleet, the Japanese submarine force, whose submarines took up positions in the Hawaii area prior to the Pearl Harbor attack. It was also the mustering point for Wake Invasion Force. Nimitz made the decision, against the advice of his staff and subordinate commanders, to bypass the outlying atolls of the Marshall group and attack the Japanese headquarters on Kwajalein. This turned out to be one of his best decisions. The Japanese had assumed that the Americans would have to seize one of the outer atolls first and had deployed the bulk of their troops away from Kwajalein. The Americans had also learned some hard lessons at Tarawa, and the preliminary bombardment would be far more effective and more of the troops would be landed in amtracks with due attention to the tides. As a result, casualties were far lighter than at Tarawa in spite of having to defeat a larger garrison. Preliminary raids against Kwajalein began as early as 4 December 1943, when Pownall took a force of six carriers, ten cruisers and eleven destroyers to bombard the island. 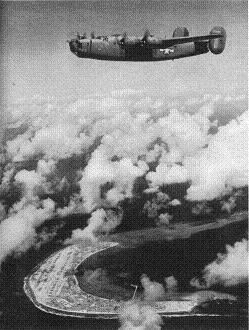 The Americans put 249 aircraft over the atoll, which sank six transports and shot down 55 aircraft for a loss of just 5 of their own aircraft. However, the incoming strikes were detected by the Japanese, who were able to put about 50 fighters into the air, and the results were less than had been hoped for. Pownall withdrew at once, citing the exhaustion of his pilots and the lack of night fighter support. During the withdrawal, Lexington took a torpedo in her stern that rendered the carrier unsteerable for twenty minutes. Long-range bomber strikes in January 1944 failed to completely suppress Japanese air power in the Marshalls, but beginning on 29 January a series of powerful carrier strikes annihilated the remaining Japanese aircraft.These continued through the landing operations and completed on 6 February with the final strikes on Eniwetok. These strikes were carefully coordinated, with top cover to intercept any Japanese fighters while additional Hellcats strafed aircraft revetments, Dauntlesses bombed antiaircraft positions, and Avengers dropped fragmentation clusters on revetments and 2000-lb (920 kg) bombs to crater runways. The last Japanese aircraft seen over Kwajalein was shot down on 29 January. The cost to the Americans was 49 aircraft and 48 aircrew out of 4021 strike sorties. Landings commenced on 31 January. The first landings at the north end of the atoll were on the small islets of Ennuebing and Mellu, which guarded the pass to the southwest of Roi-Namur. These landings were made by 25 Marine Regiment, which quickly overcame light opposition to clear the way for the gunners of 14 Marine Regiment to set up their artillery. The pass and lagoon were then swept by minesweepers, and a second set of landing teams seized Ennubirr and Ennuemennet, to the southeast of Roi-Namur, that afternoon. Marine casualties from these operations were 24 dead or missing and 40 wounded. The main landings on Roi-Namur were made the next day by the remaining two regiments of 4 Marine Division (Schmidt). Roi-Namur was even more heavily garrisoned and fortified than Betio, the main objective at Tarawa, had been two months earlier. The garrison consisted of 600 troops of 61 Guard Force, 2000 aviation and support troops, and about 400 other troops. The defenses included nine blockhouses and 65 pillboxes. Fortunately, the most formidable of these fortifications, five circular concrete pillboxes with steel gun shields and walls four feet (1.2 meters) thick, were positioned to cover the seaward approach rather than the lagoon. The American landing craft did not have any difficulty crossing the reef, and the landing force received excellent gunnery support from Admiral Connolly's TF 53. Connolly ordered his gunfire support ships to move almost recklessly close to the beach, allowing his gunners to systematically pick out and destroy the Japanese fortifications. Some 6000 tons of explosives were expended in the bombardment, compared with 2400 tons at Betio. Roi was quicky overrun, and the Marines who reached the northern beaches at 1700 found that the remaining Japanese troops had killed themselves by placing their rifle muzzles under their chins and pulling the triggers with their toes. Resistance on Namur was much stiffer, and the Japanese garrison was not overcome until 2 February. At one point a squad of Marines accidentally detonated a blockhouse full of torpedoes and other munitions, which threw debris a thousand feet (300 meters) into the air and killed 40 Marines. One of the survivors was a member of the attacking squad, who was blown 150 feet (50 meters) into the lagoon but was miraculously unhurt. The Marines suffered a total of 740 casualties, while the Japanese force of 3700 was annihilated. The first landings at the southern end of the atoll also took place on 31 January. Elements of Reconnaissance Troop, 7 Division came ashore on Gea and Ninni islets west of Kawajein. The Ninni force landed on Gehh by mistake but quickly switched to the correct objective, and both islets were quickly secured. The Ninni force returned to Gehh on 2 February and killed 125 Japanese sailors from a sunken patrol boat, at a cost of three dead and 21 wounded. The troopers found 75 secret charts of Japanese harbors, a tremendous intelligence coup. Meanwhile 17 Regimental Combat Team landed on Enubuj and Ennylabegan islets between Gea and Kwajalein. The landing force had heavy gunfire and air support that stunned the few defenders. Ennylabegan was quickly converted to a landing craft overhaul base, while artillery was emplaced on Enubuj and registered on Kwajalein. Kwajalein itself was assaulted the next day, 1 February 1944, by the balance of 7 Division (Corlett) with support from Admiral Turner's TF 52. Foul weather limited air support, but seven battleships and three heavy cruisers bombarded the islet with over 2000 large-caliber rounds and more than 5000 5" rounds. Another 161 tons of explosives were fired by the artillery on Enubuj. A landing on the concave lagoon side of the islet would have been subject to crossfire and was ruled out, while a landing on the ocean side would run into the strongest defenses. The landings therefore took place on the extreme western end of the island, with artillery support from Enubuj and from warships on both sides of the islet. The fire support was so effective that 1200 men came ashore in the first 12 minutes with no casualties. The Army artillery then maintained a creeping barrage ahead of the advancing American troops. Kwajalein was relatively lightly fortified, with about 15 pillboxes, mostly on the ocean side. The garrison consisted of about 4800 troops, including most of 61 Guard Force (Akiyama), a company of 4 Yokosuka SNLF, and 800 Army troops from 1 Amphibious Brigade. Japanese resistance was initially light, but began to be better organized two hours after the landings, and the advance halted for the night after advancing 950 yards (870 meters). A small counterattack at 2300 caused some concern but was beaten off. The next day the Americans advance continued, with ample but somewhat uncoordinated tank support, and half the island was controlled by nightfall. 3 February saw the strongest Japanese resistance of the battle, which was centered around an area of blockhouses south of Nob Pier. The shattered buildings offered excellent cover to the defenders, leading to some of the first street fighting of the Pacific campaign as the Americans gradually cleared the area. Two counterattacks that night were beaten off, and the islet was declared secure the next day, though mopping up continued until the 7th. The Americans suffered 1130 casualties, while only 265 of the defenders survived to be captured. Most of these were Korean laborers. The remaining islets of the atoll were secured without great difficulty, except for Ebeye with its seaplane base. The island was bombarded with 639 tons of shells and 87 tons of bombs prior to landings by 17 Regimental Combat Team on 3 February. The landings on the southern end of the islet, were almost unopposed, but more organized resistance was encountered as the troops moved north. The islet was secured by noon on 4 February. On 6 February the atoll as a whole was declared secured. Total American deaths in the campaign numbered 372, with another 1582 wounded. The Japanese suffered 7870 killed and 265 taken prisoner. 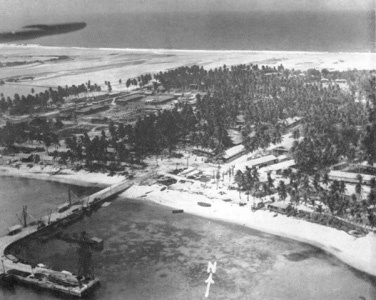 The Americans quickly refurbished the airfield on Roi-Namur, renaming it Dyess Field, and also refurbished the seaplane base on Ebeye. The first fighters, from VMF-224 and VMF(N)-532, arrived on 15 February. Two runways were constructed on Kwajalein islet, of 400 feet (1200 meters) and 6300 feet (1900 meters). By 1 April 1944 there were 14,000 men stationed on Kwajalein, 6500 on Roi-Namur, and a few thousand on Ebeye.